Happy Monday! So excited to start off the week with a finished project to show you. 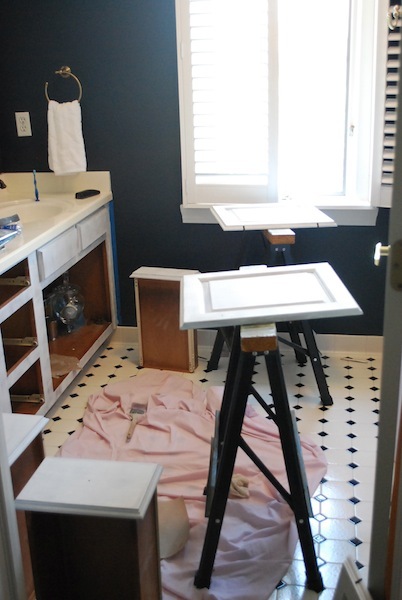 Friday afternoon I posted on Facebook that I would be painting the guest bathroom vanity. Well, nothing like a little social media pressure to force me to finish something. I'm usually in a hurry to get things started and just jump right in. However, a little prep work saves time and energy in the long run. I began the project by removing the doors and drawers from the cabinets. I then used the 80 grit sanding sponge to take the sheen off the cabinets and rough them up a bit. Using the foam roller and paint brush, I applied the primer. 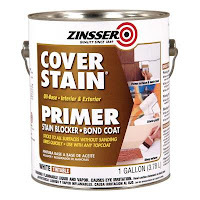 If you use the oil-based primer, you'll be glad to have a mask on and the windows open. That stuff is TOXIC... yuck! When the primer dried, I used the 220 grit sanding sponge to smooth out any spots that needed it. Then, I got to the fun part... painting! I followed the advice of others to use foam rollers, but I found that it left too many bubbles in the paint for my taste. (Maybe I was applying it wrong?) I just rolled on the paint and dragged my paintbrush through it, and I was happy with the result. I lightly sanded after the first coat of paint and applied a second coat. I let it dry overnight before reattaching the doors. Some new cabinet hardware and this bad boy's makeover will be complete. Oh, I could have saved you so much time by only using a few items for the same outcome. I just painted our cabinets a few weeks ago and used Benjamin Moores Advanced paint which is for cabinets and furniture. No priming needed. It is built in. It has very little smell and has a leveling agent in it which makes the brush marks not show when it dries. I used a brush on ours and they look like they were sprayed. Yours look very good and look like the same color as mine. I used a gray, too. I'm going to be in Indy for a few days this week. Have any time for a short get together? Coffee? The cabinets look good, can't wait to see the new hardware! I tried a foam roller yesterday and had the same bubbles you mentioned and went back to brush only. I might try it again and brush after roller - thanks for the good idea! @ Kim, I've been trying to find the name of that paint, thanks to you too! They look great! I did the same thing with my bathroom cabinet which was also a dark oak - looks wonderful all fresh and clean in BM Cloud White. I also used a foam roller and switched back to a brush - I just lightly skimmed it with the foam roller to remove any brush strokes. But once it was sanded, it was really smooth. This looks awesome! I love the grey color and you did such a good job. I'm sure it feels great to get that done! Very nice job!!! I'm currenting in the middle of painting the out side of our house. The bathroom's next, and I may or may not be doing the same thing to my bathroom cabinetry. Just sayin'! Wow! I love how good they look now. Grey has become such a popular color on cabinets now and it looks great in your bathroom. I know you must be glad to have that project done. You just made your bathroom look so much more expensive now! Amazing, even after all these years, what a paint job can do to improve a piece! The bathroom just looks fresher and cleaner (which is good in a bathroom!) and probably makes the room look brighter too! What a difference paint makes!! Your bathroom is stunning! Love the mirrors! Love the old cabinets that now look like new cabinets! Fabulous job!